The pressure was on… in a room with seventy employers from 20 leading companies, 200-plus students from 11 universities across the UK, great speakers from household-name companies, a Brexit-themed competition, and not least, a giant green smoothie (courtesy of Pepsico) – it could only be the 2016 IT Management for Business Degree north event. 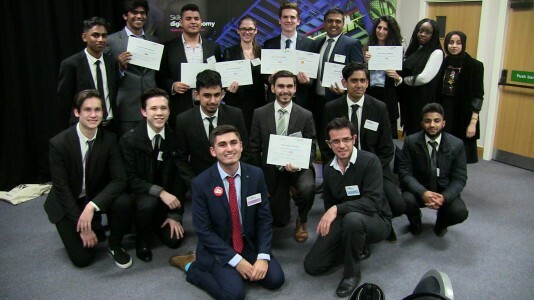 In the team competitions, the winning idea went to our 2nd-year IT Management for Business (ITMB) students whose idea to create a peer-to-peer currency exchange app won over judges to scoop the 1st place £500 prize fund. A team of our 2nd year Software Engineering for Business (SWfB) students won 3rd place with their idea for an app that will allow employers and employees to stay in close contact even if they are not based in the same country. Many congratulations to our students and SWfB and ITMB programme lecturers: Antonios Kaniadakis; Rachel Appleton and Eranjan Padumadasa, who prepared and supported the students for the ITMB’s annual North Event, and also to all ITMB and SWfB students who could not attend the event in Manchester, as they have provided fantastic support to their classmates towards shaping the final proposals through constructive feedback and their community spirit! ITMB and SWfB programmes are accredited Tech Industry Gold Degrees by the Tech Partnership (a growing network of employers creating the skills for the digital economy). Tech Industry Gold degrees are defined by employers to provide students with the most relevant technical, business and professional skills that place them in high demand in the tech sector.